This study was designed to explore the feasibility of replacing the conventional peri-/intratumoural ultrasound (US)-guided technetium-99m albumin nanocolloid (99mTc-nanocolloid) administration by an injection of the same tracer guided by a freehand single-photon emission computed tomography (SPECT) device in patients with non-palpable breast cancer with an iodine-125 (125I) seed as tumour marker, who are scheduled for a sentinel lymph node biopsy (SLNB). This approach aimed to decrease the workload of the radiology department, avoiding a second US-guided procedure. In ten patients, the implanted 125I seed was primarily localised using freehand SPECT and subsequently verified by conventional US in order to inject the 99mTc-nanocolloid. The following 34 patients were injected using only freehand SPECT localisation. In these patients, additional SPECT/CT was acquired to measure the distance between the 99mTc-nanocolloid injection depot and the 125I seed. In retrospect, a group of 21 patients with US-guided 99mTc-nanocolloid administrations was included as a control group. The depth difference measured by US and freehand SPECT in ten patients was 1.6 ± 1.6 mm. In the following 36 125I seeds (34 patients), the average difference between the 125I seed and the centre of the 99mTc-nanocolloid injection depot was 10.9 ± 6.8 mm. In the retrospective study, the average distance between the 125I seed and the centre of the 99mTc-nanocolloid injection depot as measured in SPECT/CT was 9.7 ± 6.5 mm and was not significantly different compared to the freehand SPECT-guided group (two-sample Student's t test, p = 0.52). We conclude that using freehand SPECT for 99mTc-nanocolloid administration in patients with non-palpable breast cancer with previously implanted 125I seed is feasible. This technique may improve daily clinical logistics, reducing the workload of the radiology department. The use of mammographic screening in nationwide programs within western countries has led to an increase in the number of women with non-palpable breast cancer lesions [1, 2]. Currently, more than 25% of the radiological suspicious breast lesions are considered clinically non-palpable . Accordingly, in many patients, accurate pre- and intraoperative localisation of these non-palpable lesions is important for adequate breast-conserving surgery. At present, four different techniques are used to localise the tumour prior to excision: wire-, ultrasound (US)-, carbon- and radio-guided (i.e. guided by a radionuclide) localisation [3–5]. When lymph node involvement is undetermined, these approaches are combined with a sentinel lymph node (SLN) procedure [6, 7]. At The Netherlands Cancer Institute, both radio-guided occult lesion localisation (ROLL) with radioactive technetium-99m albumin nanocolloid (99mTc-nanocolloid) and radioactive seed localisation (RSL) are used for non-palpable breast tumour localisation during surgery . In the case of RSL, a 3.7 to 10.7 MBq iodine-125 seed (125I) with a half-life time of 60 days is preoperatively implanted into the malignancy using US guidance in most cases. When the tumour was only visible on mammography, placement of the 125I seed was performed under stereotactic guidance. In our institute, the location of the 125I seed is always confirmed by an additional mammogram at the day of implantation. Recent studies show advantages when looking at resection margins, duration of localisation and surgical excision time for RSL or ROLL over wire-based localisation ,[9–11]. At The Netherlands Cancer Institute, RSL is a standard procedure, and over 1,000 125I seeds have been implanted since 2008. In all patients scheduled for tumour excision, the procedure is combined with sentinel lymph node biopsy (SLNB) for regional staging of the disease. This staging is of great significance for patient outcome, being a predictor of presence for further metastasis in the axillary basin . Clinical protocols for this procedure may vary between institutes because the radiocolloid injection site for SLNB is still a matter of controversy [13–17]. At The Netherlands Cancer Institute, the 99mTc-nanocolloid for SLNB in non-palpable breast cancer is preferably administered intratumourally by US guidance, although, in clinical practice, it turns out to be either peri- or intratumoural. Peritumoural is defined as the area at least within a radius of 10 mm to the tumour border. Intratumoural injections can sometimes result in resistance of the tumour tissue while administering the tracer; this is solved by small injection volumes (<0.2 ml) and to slowly pull a little bit back while administering the tracer. This peri- or intratumoural radiopharmacologic administration will result in extra-axillary SLNs, which, in our institute, are included for diagnosis . Prior to surgery, the radiologist localises the 125I seed by ultrasonic reflection of the titanium capsule in order to place a needle into the tumour. Subsequently, a nuclear physician injects the 99mTc-nanocolloid . This can be a challenging intervention due to difficulties in localising the 125I seed in pathological and irregular breast tissue. Furthermore, the procedure requires two medical specialists (e.g. a radiologist and a nuclear physician) and a technologist. By avoiding this additional US procedure, the workload of the radiology department will be decreased. Recently, a novel freehand single-photon emission computed tomography (SPECT) system (declipse® SPECT, SurgicEye GmbH, Munich, Germany) for three-dimensional (3D) radio-guided imaging and navigation has been introduced. This device combines a conventional gamma probe with an optical tracking system. An algorithm links the measured counts from the location of the gamma probe in space and, accordingly, reconstructs a 3D visualisation [20, 21]. The purpose of this study is to validate 125I seed localisation guided by freehand SPECT in patients with non-palpable breast cancer in order to facilitate 99mTc-nanocolloid injections. The results of this study could also serve as a proof of concept for use of this specific radio-guided navigation technique in other malignancies. Group 1: In ten patients in the period from October 2012 to December 2012, the location and depth of the 125I seed were measured using both freehand SPECT and US. The 99mTc-nanocolloid was injected exactly according to the standard protocol based on US-guided injections, which is the technique of choice at the Netherlands Cancer Institute. The standard protocol means no additional SPECT/CT scan to limit additional radiation exposure for patients. Group 2: In the period from December 2012 to April 2013, 34 patients were included. The location and depth of the 125I seed were measured using freehand SPECT followed by a freehand SPECT-guided injection with 99mTc-nanocolloid. These 34 patients received a SPECT/CT scan to measure the accuracy of the 99mTc-nanocolloid injection location in relation to the 125I seed. Group 3: The control group was constituted retrospectively by 21 consecutive patients who underwent US-guided 99mTc-nanocolloid injection near the 125I seed and a SPECT/CT in the period from April 2012 to March 2013. This means that only those patients who had received a SPECT/CT in the context of a standard SLN procedure (i.e. non-visualisation of lymphatic drainage or aberrant lymphatic drainage on the planar imaging) were included. This group is selected to study the US-guided injection depots of 99mTc-nanocolloid by means of SPECT/CT without making additional SPECT/CT scans. All patients who are to undergo a SLNB get a 99mTc-nanocolloid (GE Healthcare, Eindhoven, The Netherlands) injection of 140 MBq in 0.2 ml 1 day prior to surgery. Five-minute static scintigraphic images are acquired from the anterior and lateral sides 5 to 30 min and 2 to 3 h post-injection, respectively. In case of non-visualisation or aberrant lymphatic drainage, an additional SPECT/CT scan is obtained. All SPECT/CT data are acquired using a hybrid camera (Symbia T, Siemens, Erlangen, Germany). The dual-head SPECT (128 × 128 matrix, 40 frames, 30 s/frame) is performed using 9° angular steps in a 30-s time frame. For CT (130 kV, 40 mA, B30s kernel), 5-mm slices are obtained. Both attenuation and scatter correction are applied. This method was based on combining counts measured with a conventional gamma probe with data of the location and orientation of the gamma probe using a reflective reference target attached to a specific site on the probe. Through a calibration procedure, the relation between the gamma probe tip and the reference target was determined . To acquire an accurate 3D volume reconstruction from the count data, a surface scan was made by hovering the probe over the area of interest in three different orientations (e.g. x, y and z planes). The system requires at least 1,500 measurements to accurately create a 3D visualisation; in our protocol, we adopted thus a minimum of 2,000 measurements in three or more directions. This planar surface scanning takes about 2 min, and the reconstruction of the volume takes another 20 s. After the reconstruction, the optical camera of the used system was combined with a radioactivity map (Figure 1b). The window level was adjusted by using a touch screen to set a visualisation threshold similar to the ones used in conventional nuclear medicine until the number of hot spots equals the number of 125I seeds in situ. The 3D window enabled the best navigation to the 125I seed (Figure 1c). Freehand SPECT method. (a) Data acquisition using the freehand SPECT device; radioactivity is measured with the probe from multiple directions. P is the probe, and in yellow, the detection beam of the probe. The orange cloud is an accumulation of the area where it is measured. (b) The localisation of the 125I seed after reconstruction. The 125I seed reconstruction is projected over the optical image in purple. T is the patient tracker. (c) 3D visualisation of the distance and direction of the probe tip to the 125I seed. (d) Injection of 99mTc-nanocolloid guided by freehand SPECT. I is the tracer injection localisation. For patients of group 1, the perpendicular distance from the skin to the 125I seed was determined with the freehand SPECT, and the most intensive focus in the 3D reconstruction was marked on the skin of the patient. Next, the radiologist, who was blinded for the depth information, localised the 125I seed with US and measured the perpendicular depth from the marked place on the skin to the 125I seed. After which, he injected the 99mTc-nanocolloid close to the 125I seed. To avoid breast tissue deformations, it is important that the patient does not change position during the freehand SPECT and US measurements. For patients of group 2, the perpendicular depth to the 125I seed, which was used for US-guided injections as well, was measured per patient, and the optimal injection location was marked on the skin. The needle was injected to the depth indicated by the freehand SPECT (Figure 1c). Three hours after injection of the 99mTc-nanocolloid, a SPECT/CT scan was obtained. Verification of the 99mTc-nanocolloid injection relative to the 125I seed was performed by comparing the 99mTc-nanocolloid depot on the SPECT images to the location of the 125I seed on the CT scan. The distance from the 125I seed to the centre of the activity depot in the axial plane was measured. All distances on SPECT/CT were once more determined by a second independent blinded observer to study the limits of agreement. Continuous variables were represented by mean ± standard deviation (SD). Differences between the measured depths of the 125I seed by freehand SPECT and US are evaluated by Bland-Altman graphs. The limits of agreement between the different observers were also evaluated by Bland-Altman graphs. This results in mean difference and 95% confidence interval (95% CI) . The characteristics of all ten patients are outlined in Table 1. The lesions were found on various locations in the breast. The ten perpendicular measurements with US and freehand SPECT of the 125I seed resulted in absolute variations in the range from 0 to 5 mm. The average difference in depth was 0.05 ± 2.4 mm (range −3.5 to 5 mm), and the absolute average was 1.6 ± 1.6 mm (range 0 to 5 mm). These data are displayed in a Bland-Altman plot, which visualises the mean and the 1.96-time standard deviation ranges  (Figure 2). DCIS, ductal carcinoma in situ; IDC, invasive ductal carcinoma; ILC, invasive lobular carcinoma; LCIS, lobular carcinoma in situ. Bland-Altman analysis for the distances in depth measured with US probe and with the freehand SPECT. The analysis indicates, with the black broken line, the average of the measurements. The upper and lower red broken lines represent the Bland-Altman limits within the 95% confidence interval. The characteristics of all 34 patients are outlined in Table 1. The patients had either one or two 125I seeds implanted, and the tumours were located on various locations within the breast. The average distance from the centre of the 99mTc-nanocolloid depot to the 125I seed on SPECT/CT was 10.9 ± 6.8 mm (range 0 to 29 mm). Retrospective analysis of the data showed a possible relation between the number of measurements made by the freehand SPECT and the distance between the 99mTc-nanocolloid injection depot and the 125I seed. In ten injections, we noticed that the number of measurements was more than the protocolled 2,000 to 2,500 but was 3,000 to 3,500 measurements at least. We evaluated the differences to study whether a higher number of measurements will result in more accurate injections. The ten injections with more measurements resulted, after measuring the distance between the 99mTc-nanocolloid injection depot and the 125I seed, in a mean distance of 10.0 mm instead of 11.2 mm in the other 26 injections. In the retrospectively selected US-guided 99mTc-nanocolloid injections (patient group 3), the distance from the depot to the 125I seed was 9.7 ± 6.5 mm (range 2 to 30 mm) on SPECT/CT. Comparison of the distance from the depot to the 125I seed in the freehand SPECT- (group 2) and US-guided injections (group 3) revealed no significant difference (two-sample Student's t test, p = 0.52). 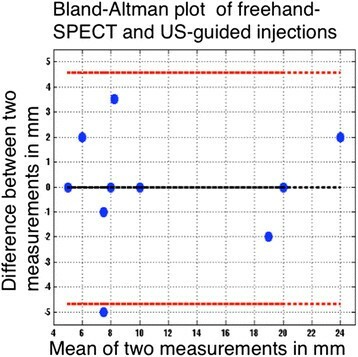 This means there is no difference in accuracy for US-guided and freehand SPECT-guided injections. The mean difference between the two observations in this setting was 0.5 mm (95% CI 2.9 to −3.5 mm); for freehand SPECT-guided injections, the difference was 0.1 mm (95% CI −3.0 to 3.1 mm), and for the US-guided injections, the difference was 0.9 mm (95% CI −2.2 to 4.0 mm) (Figures 2 and 3). There are images included in this work that illustrate the location of the 125I seed and the 99mTc-nanocolloid depot by a fusion of the SPECT signal and the CT scan (Figure 4). Bland-Altman analysis for the interobserver agreement between freehand SPECT-guided and US-guided injections. The analysis indicates, with the black broken line, the average of the measurements. The upper and lower red broken lines represent the Bland-Altman limits within the 95% confidence interval. Axial SPECT/CT images. 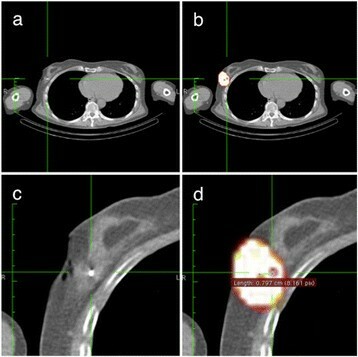 (a) The low-dose CT. (b) The SPECT and CT images fused. (c) Close-up of the low-dose CT. (d) The SPECT and CT images fused with the measurement of distance from the centre of activity of the 99mTc-nanocolloid to the 125I seed; the measured distance is 8 mm. The green lines indicate the same position in the different images. In total, 65 peri-/intratumoural 99mTc-nanocolloid injections were included in this study for analysis. The overall sentinel node (SN) identification rate was 1.2 SNs/patient, and 56/65 had SN visualisation on either lymphoscintigraphy or SPECT/CT. The intraoperative SN identification rate was higher, thanks to prolongation of the time interval (allowing further lymph drainage) and the use of blue dye. This study demonstrates that peri-/intratumoural 99mTc-nanocolloid injections using a freehand SPECT device are feasible in patients with non-palpable breast cancer marked with a 125I seed. The freehand SPECT is able to localise the 125I seed and obtains navigation parameters for subsequent SLN procedure-related tracer injection. The manufacturer specified a spatial resolution of 5 mm for the freehand SPECT, suggesting that this device was appropriate for the intervention described in our study . Our results confirmed this by showing a mean difference of 1.6 ± 1.6 mm (range 0 to 5 mm) compared to the conventional US technique. Additionally, it was concluded that the concordance of freehand SPECT-guided administrations compared to US-guided administrations validated by means of SPECT/CT imaging was clinically acceptable for the approach that we pursue. This study was not designed to study a learning curve; we also did not find a learning curve in this limited number of cases. This might be the result of varying observers. However, to use the freehand SPECT device, a training period is required. The results of this study and the benefits of using this technique seem to support the use of freehand SPECT for 125I seed-guided radiocolloid injections in patients scheduled for SLNB and thereby enhance the logistics and workload of nuclear medicine and radiology departments. For SLNB, US-guided injections are commonly used to deliver 99mTc-nanocolloid into or in the vicinity of the tumour . In cases where the 125I seed is not identifiable, a stereotaxic procedure is performed. The US-guided injections and the stereotaxic procedures have certain drawbacks; first of all, the planning is more complicated because there are two departments involved, and the time per procedure is variable (15 to 45 min). Furthermore, the localisation of the 125I seed may be time consuming and requires a radiologist. The injection using freehand SPECT is straightforward and, as described in the present study, clinically applicable. The procedure can be performed in a nuclear medicine department, which does increase the flexibility in planning. In our experience, the procedure never exceeded 20 min, taking, in average, 10 to 15 min. A second benefit is that this procedure may avoid potential pitfalls in misjudging the identity of the 125I seed and thereby an incorrect injection location of 99mTc-nanocolloid in patients with other types of markers in situ or calcifications in the breast. These other non-radioactive markers do not affect the freehand SPECT technique. The radiocolloid injection site for SLNB is still a matter of controversy [13, 14, 16, 17]. The freehand SPECT method as described in this study is only of clinical relevance for tumour-related tracer administration. For injections in the vicinity of the tumour, this technique is sufficient. However, for injections in small lesions, this technique requires more precision. This could be acquired with an optically tracked needle integrated in the freehand SPECT system. There are prototypes of needles or catheters with optical tracking systems, enabling exact needle tip localisation and thereby possibly more accurate injections . For the 36 freehand SPECT-guided injections, we used 15-, 25-, 35-mm needles, and the depth was determined on the basis of depth estimation. There are several possibilities to explain the observed distance deviation between the 99mTc-nanocolloid injection depot and the 125I seed on SPECT/CT. First, the use of older (weaker in radioactivity) 125I seeds may give significantly less signal, which influences the image quality. Another explanation could be the fact that the freehand SPECT device indicates a depth and a direction, which are marked on the skin. The nuclear physician had to inject exactly similar to this direction, or else larger deviations in deeper injections would logically be the result. Further analysis of the relation of depth and inaccuracy hinted to a relation, where an increase in depth results in more inaccurate injections (correlation of 0.58) (Figure 5). When only the 125I seeds with a depth of <26 mm are taken into consideration (25/36 125I seeds), the average distance between the 99mTc-nanocolloid injection depot and the 125I seed is 8.2 mm (SD 5.1 mm, range 0 to 20 mm) This is less than the average distance measured on the SPECT/CT scans for all US-guided injections (group 2). Distance vs. depth. 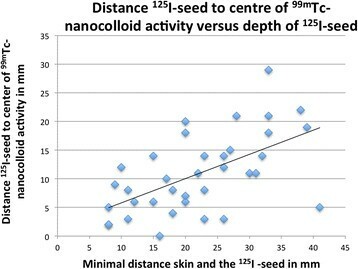 Distance from 125I seed to the centre of the 99mTc-nanocolloid activity versus the depth of 125I seed from the skin. The retrospective evaluation of the accuracy in ten injections with higher number of measurements demonstrated a mean distance of 10.0 mm instead of 11.2 mm in the first 26 injections; this suggests a favourable relation to obtain more measurements. With these small numbers, this is not a significant conclusion. Nevertheless, we recommend using higher number of measurements, because more data for the calculations would logically result in more accurate reconstructions and could, for example, compensate the weak signal of older 125I seeds. An additional source of error in the evaluation might be the registration between CT and SPECT and the slice thickness of the CT images. These factors can have both positive and negative impacts on the evaluation but have to be considered when looking at the standard deviation of the results. In the present study, freehand SPECT reconstruction was based on settings used for standard intraoperative procedures. In theory, it is possible to increase the number of iterations or reduce the voxel size. The standard number of iterations for reconstruction is 20; experimental settings where the number of iterations rises up to 100 iterations can result in more accurate localisations but may drastically increase the reconstruction time. The voxel size is also variable; this can be reduced from 5- to 2-mm voxels. Experimental setups will be required in the future to evaluate which are the optimal settings for specific applications. This study also demonstrates potential use of freehand SPECT for intraoperative 125I seed localisation since accurate navigation to the radioactive tumour marker is enabled. Furthermore, the margins of breast cancer specimens relative to the 125I seed could be determined ex vivo as predictor for surgical margins. A prospective study to investigate this assumption is currently in preparation. Peri-/intratumoural 99mTc-nanocolloid injection for SLN mapping using freehand SPECT in patients with non-palpable breast tumours and implanted 125I seeds for tumour excision is feasible. This approach may become a reliable alternative for US-guided 99mTc-nanocolloid injections, alleviating daily/clinical logistics in both nuclear medicine and radiology departments. We would like to thank our clinical partners from the Radiology Department for their support and the additional measurements. Also, our acknowledgements to the technical staff of the Department of Nuclear Medicine for the SPECT/CT acquisition. This work was performed in the framework of the Eurostar's project ‘E!7103, real-time fhSPECT’. The authors declare that they have open access. This article is distributed under the terms of the Creative Commons Attribution Non-Commercial License which permits any non-commercial use, distribution, and reproduction in any medium, provided the original author(s) and source are credited. BP drafted the manuscript, substantially contributed to the conception and design of the study, and acquired, analysed and interpreted the data. LWV substantially contributed to the conception and design of the study and revised the manuscript critically for important intellectual content. DH and OB substantially contributed to the conception and design of the study and acquired clinical data. MVP drafted and revised the manuscript critically for important intellectual content. MS and RVO approved the final manuscript for submission and publication and revised the article critically for important intellectual content. All authors read and approved the final manuscript. Traub J, Wendler T: [http://www.surgiceye.com/en/declipseSPECT/openSurgery.html] http://www.surgiceye.com/en/declipseSPECT/openSurgery.html, 05–2014]. SurgicEye. GmbH.